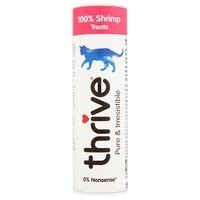 Thrive 100% Natural Cat Treats (Shrimp) are delicious small treats that have been made using 100% shrimp that you can give your cat as a healthy everyday snack. Freeze dried to lock in all of the natural flavours and to preserve the minerals and vitamins, Thrive Cat Treats are pure, irresistible and will quickly become a firm favourite. Thrive Treats contain no additives, preservatives or colourings and come in a resealable tube to maintain freshness.